A mellah (Arabic: ملاح‎ and Hebrew: מלאח, the Arabic meaning "salt spring" or "salt marsh" which was the area of the first Jewish settlement in Fez) is a walled Jewish quarter of a city in Morocco, often mistakenly conflated with the European ghettos. Jewish population were confined to mellahs in Morocco beginning from the 15th century and especially since the early 19th century. In cities, a mellah was surrounded by a wall with a fortified gateway. Usually, the Jewish quarter was situated near the royal palace or the residence of the governor, in order to protect its inhabitants from recurring riots since its inhabitants played a vital role in the local economy. In contrast, rural mellahs were separate villages inhabited solely by the Jews. While the settling location of Jews was by Muslim rulers was typically imposed, the mellah existed in a relatively autonomous fashion, with Jews building and sustaining their own communities within the walls of their quarter. Indeed, there was resistance to forced relocation, but ultimately the Jewish mellah became a sanctified space that the Jews had pride for. "The one gate that gave way to the medina, which could have easily been repudiated as an emblem of imprisonment, instead came to be treated as an object of reverence by the mellah ’s inhabitants, as we see in this description from the early twentieth century: If one stops for a moment in front of this gate, one sees a curious thing: All who pass, children, beggars, peddlers driving their donkeys loaded with merchandise, old women, hunched-over men, all approach this dusty wall and press their lips against it with as much fervor as if they were kissing the holy Torah." The mellahs of Morocco primarily came about as Jews migrated to Morocco after being expelled from the Iberian Peninsula during the Spanish Inquisition. There were two primary justifications given for mellahization. First, these Jewish quarters were often in close proximity to the ruling local powers, offering a form of protection for the Jews. This explanation also addresses the resulting effective authority over differing religious populations; if all the Jews are physically together, it is easier to maintain effective muslim rule, assess taxes, and keep count of the community. The second justification of cause for the institution of the mellah is the idea that mellahs were a "collective punishment for specific transgressions." Jews were associated with ethical deviance, physical malformation, and disease and so were separated from the Christian and Muslim populations. Organization relative to the city as a whole gives insight into how Jews were situated compared to the Muslim majority and how relevant these justifications are to specific mellahs. "Sometimes the quarter is contained within the larger city and forms a microcosm of it, such as the Jewish quarter of Tetuan; at other times, it is removed from the molecular city and attached to the royal enclave, as in Fez. The siting of the quarter invites speculation about its origins and the relationship between the Jewish minority and the Muslim majority. Was the purpose of the quarter to isolate its inhabitants, to safeguard them, or both? In Fez, the proximity of the mellah to the royal palace is often read as a sign of dependency of the Jews on the power and protection of the ruling sovereign." The first official mellah was established in the city of Fez in 1438. In the first half of the 14th century, the Marinids founded, alongside Fez, the town of Hims, which was initially allocated to the archers and the Christian militia. In 1438 the Jews were driven from the old part of Fez to Hims, which had been built on a site known as al-Mallah, "the saline area". Ultimately, the term came to designate Jewish quarters in other Moroccan cities. Initially, there was nothing derogatory about this term: some documents employ the expression "mellah of the Muslims", and the Jewish quarter contained large and beautiful dwellings which were favored residences for "the agents and ambassadors of foreign princes". Later on, however, popular etymology explained the word mellah as a "salted, cursed ground" or a place where the Jews "salted the heads of decapitated rebels”, highlighting the outcast connotations attached to this word. The mellah of Fez was not always successful in protecting its dwellers. On May 14, 1465, its inhabitants were nearly all killed by the rebels who overthrew the Merinid dynasty. That attack sparked a wave of violence against the Jews all over Morocco. The immediate cause of the anti-Jewish violence was the appointment of a Jew to the post of vizier. For a long time, the mellah of Fez remained the only one, and only in the second half of the 16th century (around 1557) the term mellah appears in Marrakesh, with the settlement there of Jewish population from the Atlas and from the city of Aghmat (some 30 km east of Marrakesh), which had an ancient Jewish community. A Frenchman, who was held captive in Morocco from 1670 to 1681, wrote: "In Fez and in Morocco [that is, Marrakesh], the Jews are separated from the inhabitants, having their own quarters set apart, surrounded by walls of which the gates are guarded by men appointed by the King ... In the other towns, they are intermingled with the Moors." In 1791, a European traveller described the Marrakesh mellah: "It has two large gates, which are regularly shut every evening about nine o'clock, after which time no person whatever is permitted to enter or go out... till... the following morning. The Jews have a market of their own...". Only in 1682 the third mellah was founded in the town of Meknes, the new capital of sultan Moulay Ismail. 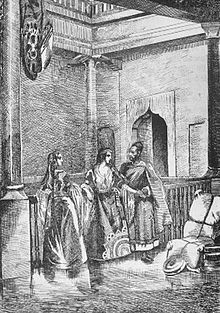 At the beginning of the 19th century, around 1807, sultan Sulayman forced Jews to move to mellahs in the towns of the coastal region, in Rabat, Salé, Mogador, and Tetouan. The new Jewish quarters were called mellahs everywhere except Tetouan, where the Spanish word judería was used. In Salé, the new Jewish quarter was a long avenue with a total of 200 houses, 20 shops and trading booths, two kilns and two mills. 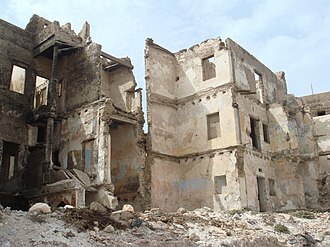 In 1865, the mellah of Mogador, having become over-populated, was permitted to extend. The mellah in Rabat was established in 1808 by Sultan Mawlay Sulaiman; this separated the Jewish and Muslim people who had lived together in a shared area of the city. At the end of the century and in the first decades of the twentieth century, affluent Jews started to move to the new neighborhoods (Villes nouvelles) planned along European urban schemes, leaving in the mellahs only the elderly and the poorest families. Since the establishment of the State of Israel, in 1948, almost all Moroccan Jews have emigrated to the new Jewish state, some fleeing persecution and some encouraged by the Jewish Agency. As a result, nowadays mellahs are only inhabited by Muslims, the few remaining Jews have moved to modern quarters of Moroccan towns. A large part of them has become historical places to visit while in Morocco. The appearance of a mellah in a Persian Gulf port, in the account of a journey to China purportedly by a "Jacob of Ancona" and supposed to be made in 1271, that was published by David Selbourne in 1997 as The City of Light, was identified as a clear anachronism in the critical reaction to the book that judged it a hoax. The Mellah of Fez faces a similar fate, however, it is currently undergoing renovation thanks to UNESCO funding. "The quarters’ squalor still exists, but they’re also picturesque and bustling — and that, too, speaks to Morocco’s vibrant Jewish past." Mellahs, walled on all four sides and typically gated, housed the Jewish population of Moroccan cities. As a result, these spaces fostered Jewish communal life through its physical structures. Mellahs were typically organized in neighborhoods and had synagogues, a Jewish cemetery, and kosher markets situated among other public areas. Even the synagogue itself facilitated a wide variety of Jewish communal needs including education, ritual baths, and spaces for children to play. While at first these quarters offered considerable comfort to Jewish families, with spacious homes and protection due to proximity to the royal palace these luxuries soon came to a close. "Yet over time, the quarters’ narrow streets became congested and overrun with people, and they became synonymous with ghettos. The Jews were confined to the inner walls of the rundown mellahs, and the areas became associated with cursed, “salted” land, much like the Jews were perceived among Moroccan society." As Jews were key players in trade and commerce, mellahs were often situated on major waterways and were usually pretty close to each other to facilitate trade networks effectively. Even more so, the mellah's market became a prominent space for not only the Jewish community, but non-Jewish peoples who would come to shop on market days. Because Jews commonly held merchant and artisan positions, the mellah was an attractive trade post for the entire city, not just the Jewish quarter. Separation certainly stifled cultural interaction to some degree, but Muslims were allowed to enter the mellah and did so if they needed goods and services that fell within the Jewish niche. Stillman, Norman (1979). The Jews of Arab Lands: A History and Source Book. Philadelphia: Jewish Publication Society of America. ISBN 0-8276-0370-3. ^ Encyclopedia of the Jewish Diaspora: Origins, Experiences, and Culture, Volume 1, p. 306, refers to Bernard Lewis 1987. ^ Colin, Georges S. “Mellāḥ.” Encyclopaedia of Islam, First Edition (1913-1936)], April 24, 2012. ^ A.I.U., Maroc II.B.9– 13, 10 March 1929, Goldenberg. ^ Gottreich, Emily (2006). Mellah of Marrakesh : Jewish and Muslim Space in Morocco's Red City. Indiana University Press. p. 21. ^ Houtsma, M. Th. E.J. Brill’s First Encyclopaedia of Islam, 1913-1936. Vol. 5. BRILL, 1993. ^ "The Jewish Community of Fez, Morocco". The Museum of the Jewish People at Beit Hatfutsot. ^ Carvajal, Doreen (9 December 1997). "Marco Polo: Is a Rivalry Just Fiction?". The New York Times. Retrieved 16 July 2008. ^ Frank, Michael (May 30, 2015). "In Morocco, Exploring Remnants of Jewish History". The New York Times. Retrieved 2018-11-29. ^ Hollowell, Thomas (2014-10-14). "The Jewish Quarters (Mellahs) of Morocco's Medinas". Journey Beyond Travel. Retrieved 2018-11-29. ^ Shmulovich, Michal (March 9, 2014). "Glimpsing Jewish memories amid the mellahs of Morocco". The Times of Israel. Retrieved 2018-11-29. ^ Gottreich, Emily (2006). Mellah of Marrakesh : Jewish and Muslim Space in Morocco's Red City. Indiana University Press. pp. 35–36. ^ Goldberg, Harvey. “The Mellahs of Southern Morocco: Report of a Survey.” The Maghreb Review, vol. 8, no. 3, ser. 4, 1983, pp. 61–69. ^ Gottreich, Emily (2006). Mellah of Marrakesh : Jewish and Muslim Space in Morocco's Red City. Indiana University Press. p. 73.